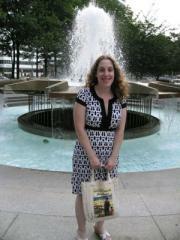 Stacy Lipson is a freelance writer from Philadelphia, PA. Her work has appeared in various publications including the Philadelphia Metro, Two One Five magazine, and most recently Sprig.com of the Washington Post.Newsweek Interactive. She is a huge bookworm and can be found reading a new book on a weekly basis. Her current interests include crossword puzzles, Scrabble, and the popular social networking site Twitter. Stacy claims her best ideas are fueled by coffee, so she sometimes forgets to eat in lieu of caffeine. Her pastimes include browsing the magazine section of Barnes and Nobles, and reading her favorite magazines two at a time. Her secret goal is to work at Adbusters in Vancouver, Canada, but she knows the weather is much too cold for her cold-blooded bones.